Ever struggled to find the best route to the pin? Plenty of golfers, pro and novices alike, struggle to get a grip on new courses all the time. With slopes, curves and traps, getting to the green quickly can be a task. I’m always carefully checking every shot I make when it comes to reaching the hole! Getting down the course in just a few strokes is tricky enough. However, you may sometimes need a little help when it comes to scoping out a path. In this Bozily Golf Rangefinder review, I’ll take a look to see why this lightweight gadget could make all the difference. Let’s firstly focus on the basics. A laser rangefinder is somewhat like a pair of binoculars. You look through them and given detailed information on how far you have to get to the hole, and what hazards, if any, you can expect on the way. Rangefinders can be amazing little pieces of technology. Before they were commonplace, old school golfers like me had to rely on wits alone! Rangefinders, however, can also help to train your eye and mathematical approach to golfing. Are you struggling to make sense of course distances? Interested in finding a legal, lightweight gizmo that can help you tighten up your strokes? Bozily’s compact gadget should have plenty of features that appeal to you. This rangefinder already outpaces plenty of the competition. And believe me, I’ve tried a few! Bozily’s model offers 6x magnification through its viewpiece and can measure distances between 5 and 900 yards. That’s a massive difference compared to similarly-priced models on the market. You get access to four different scan modes to help you analyze the course ahead. There’s a general mode which enables you to work out angles and distances. Other modes let you work with slopes, vertical measurements, and even speed. Therefore, you’re always looking to play with accuracy. There’s a nifty flag lock mode, too. This means the device will alert you and lock onto the pin in the distance when it’s spotted it. That means less fussing around for you. However, as with other rangefinder gear, you may need to have a steady approach. What I love most about this rangefinder – and I’ll come back to this at the end of my Bozily Golf Rangefinder review – is how quickly it reacts. You’ll get readings pop up on the LCD screen within seconds. This works great in all scanning and flag lock modes. However, you’re going to need a steady hand to get the best results. Even slight shaking could put accuracy off by a fair margin. Therefore, it’s the sort of gadget that’s going to need both hands. It’s easy enough to use one-handed, but accuracy is the factor here. What might put some golfers off is the size and manufacture of the rangefinder. It’s built to be lightweight and easy to carry. That’s great – but it’s also fairly plasticky, and might come across as cheaply-made. It’s a shame because it’s amazingly capable for the price tag. 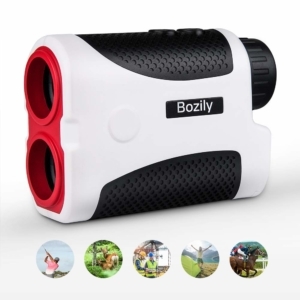 Durability and look aside, Bozily’s landmark rangefinder has helped my game no end. I say this as a seasoned golfer who’s also tried a whole host of other golfing tools and gadgets. If you need a bit of extra support in terms of accuracy, this is probably going to be a fair investment. Still unsure about the Bozily rangefinder? Let’s weigh it all up. All in all, Bozily’s main rangefinder is good support for any course. If like me, you find it useful to have an ally helping you fine-tune those shots, you’ll probably find this gizmo fascinating. However, there are a couple of niggles you might want to look out for. Interested in the model after reading my Bozily Golf Rangefinder review? The gadget is available from multiple retailers and can be bought directly via Amazon. Why not give it a go and see what a difference it could make to your own game? It could be money well invested.